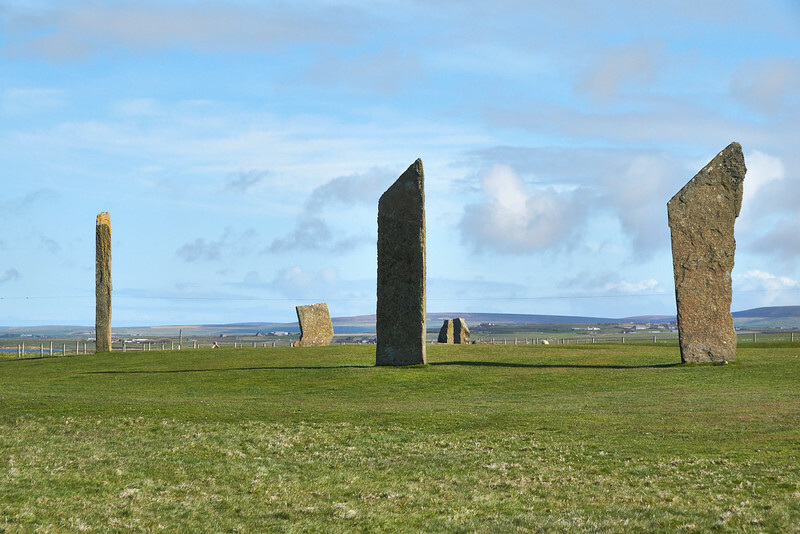 The Stones of Stenness may be the earliest henge monument in the British Isles, built around 5,400 years ago. The site now lacks its encircling ditch and bank, though excavation has shown the ditch to be 4m wide and 2.3m deep. The four surviving standing stones, stone stumps and concrete markers outline an oval that was around 30m in diameter. The focus of the interior was a large hearth; it is still visible. That the hearth was significant can be seen from the line of features that marked the approach to it – a paved path, two stone settings, another setting that was apparently a second hearth, and finally the uprights of a three-stone ‘dolmen’. Pottery and animal bones recovered during excavation tell us that Neolithic visitors cooked and ate plenty of food at the site.